An American Celebration, Mount Vernon – Fireworks, military re-enactments, a naturalization ceremony, birthday cake and a visit from George and Martha Washington are highlights of July 4th at this American history museum. Independence Day Celebration, Yorktown – Enjoy a 5k/8k run/walk, parade, U.S. Coast Guard band, concert and fireworks. Independence Day at Patrick Henry’s Red Hill, Brookneal – Featuring a speech by Virginia’s first governor, Patrick Henry, and fireworks at dusk, this is a unique, family-friendly Fourth of July celebration. Fourth at the Fort, Fort Monroe – A flag ceremony, food, live music and a fireworks display mark the Fourth at this historic fort near Hampton. 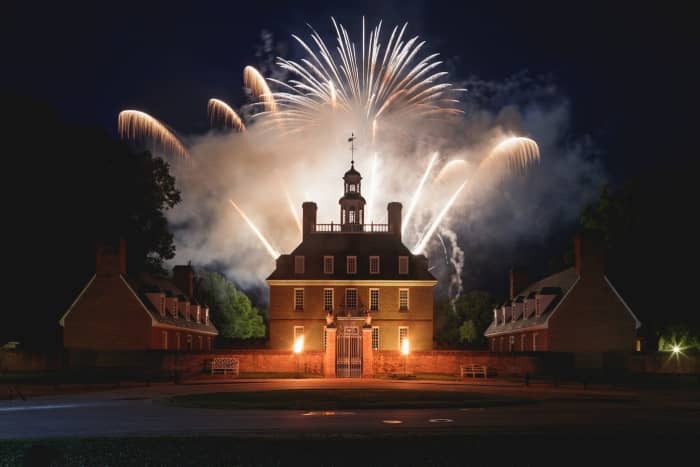 Independence Day at Colonial Williamsburg, Williamsburg – Readings of the Declaration of Independence take place throughout the day, alongside musical performances, hands-on activities for the kids and an evening fireworks display. 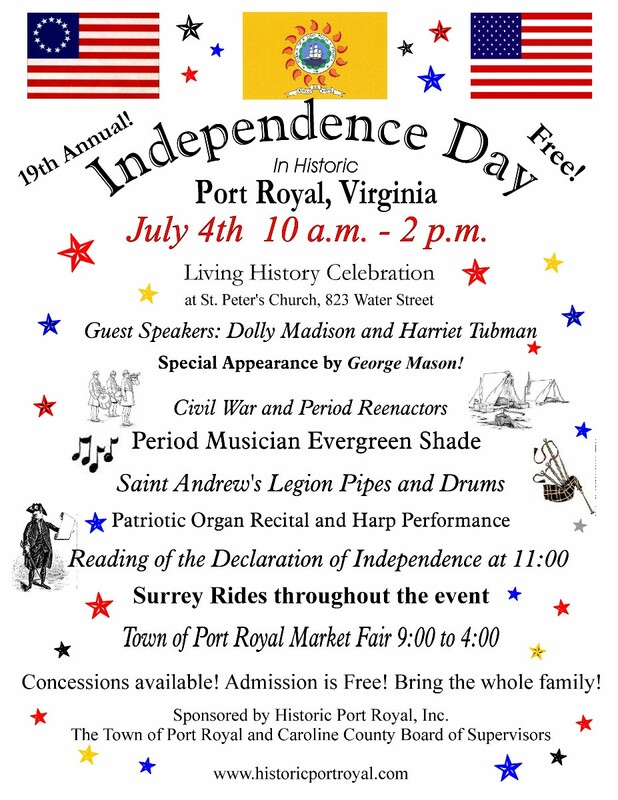 Independence Day in Historic Port Royal, Port Royal – Special appearances by George Mason, Dolly Madison and Harriet Tubman, performances of period music from the Revolutionary and Civil War areas, pipes and drums and free surrey rides. 4th of July Concert and Fireworks, Dogwood Dell, Richmond – Long-running local favorite featuring a patriotic performance by the Richmond Concert Band and a fireworks display at dusk. Stars and Stripes Explosion, Virginia Beach – Enjoy live music performances throughout the day and end your evening with a bang at the massive fireworks display. This year’s Fire, Flour & Fork food festival brought chefs, food personalities, foodies and “the food curious” from across the country to the Richmond, Virginia region to explore the best of Richmond’s food culture and history. The Carnaval Latino, a street festival held on the block of East Clay Street in front of the Valentine Museum, as well as inside the museum itself, showcased the region’s Latino heritage. From food and drinks to music, dancing, fashion and history, this event was a delicious and fun-filled evening. First, let’s talk food. Some of Richmond’s best restaurants serving Mexican and South American specialties were represented, including Pao’s Bakery, Bocata Latin Grill, Shelly’s Comida, Flora Restaurant, Empanadas Market and more. From shrimp ceviche to lamb tacos and the most delicious tres leches cake I’ve ever had, the food was the star of the show! There was also plenty of wine from Spain and other regions, as well as Steam Bell Beer Works, which had a delicious stout brewed with Mexican spices. The entertainment was varied, from traditional dancing of Mexico to Colombian salsa dancing. A fashion show from a promising fashion designer who is only sixteen years old was a highlight! The Valentine Museum also had an exhibit of Latino heritage in the Richmond region, which was filled with unique artifacts and history. My mom and I attended the Carnaval Latino to celebrate our birthdays (hers is two days before mine at the end of October), and it was a festive night out with plenty of great food and entertainment. I hope Fire, Flour & Fork does another Carnaval Latino at next year’s festival. Fire, Flour & Fork is Coming Up! Richmond’s annual festival “for the food curious,” Fire, Flour & Fork takes place November 2-5 in and around the city. This fun and informative festival highlights the city’s and the region’s food history and local ingredients. From signature dining events to classes and discussions, there’s plenty to discover as we celebrate the Richmond region’s cuisine. This year’s festival features a wine tour and luncheon at Barboursville Vineyards, a “Liquid Launch” sponsored by the Richmond Beer Trail, a Street Art and Street Food Tour and much more. Local chefs and food experts like bbq master Tuffy Stone of Q Barbecue, John Maher of The Rogue Gentleman and Yaki, Jason Alley of Pasture and Comfort and many more will be cooking and discussing foods and beverages from around the world and from right in our backyard in the Richmond region. If your interests lie in Richmond’s booming craft beverage scene, you won’t want to miss Sake at Yaki, the Gathered and Grown Cider Dinner with local restauranteur Joy Crump at Blue Bee Cider or Mezcal: Time, Place & Family at Flora on Friday, Nov. 3. Saturday’s Turning Tea on its Head at The Jefferson features tea cocktails, and Sunday’s Put a Shine on Your Holiday Cocktails with Belle Isle Craft Spirits will show you how to class up your festive drinks. Sunday’s Bartender Battle at Brenner Pass is a can’t miss event too! The Third Annual Dabney Dinner, honoring the legacy of 18th century Richmond caterer, restauranteur and barman John Dabney, features remarks from Michael Twitty, culinary historian and author of The Cooking Gene, an exploration of food, family history and the history of the American south. Saturday’s class pass offers a kickoff talk from James Beard award-winning chef and author Gabrielle Hamilton, then splits into concurrent sessions divided into Fire, Flour and Fork. Sessions on corn as an ingredient, Ethiopian spices, heritage grains, specialty breads and much more fill out the packed schedule. Tickets for some of the most popular signature events have already sold out, so be sure to get your tickets early. Special “signature event and class pass” and other combination options are available this year. On July 16, the kids and I headed to Libbie Mill for Fire, Flour & Fork‘s “Midtown State Fair.” Held behind the Libbie Mill Library, this fun, family-friendly food festival had plenty for us to do, from great eats to crafts to cooking demonstrations and more. When we arrived, the Virginia heat and humidity made King of Pops gourmet popsicles a necessity. Next, we checked out the tent area, full of local specialty foods and activities for the kids. They got to spin a prize wheel and make crafts, and we all sampled some of southern-favorite Birdie’s Pimento Cheese, Nate’s Bagels and more. There was a petting zoo where my kids enjoyed petting the goats, and a booth from Wandering Cow Farm with goat-milk soaps and other natural body care products. The highlights of the day were the Filipino folk dance demonstration and the old-fashioned cakewalk. The event was put on by the team behind the Fire, Flour & Fork food festival. Tickets for this year’s FFF, to be held in the beginning of November, go on sale August 1. Some of the events will sell out quickly, so get your tickets early! Recently I stopped by Red Cap Patisserie’s shop on Meadow Street to try out the croissants and pastries. The shop is small, with only a little space for seating, but has plenty of display space for their sweet and savory pastries, including pain au chocolat, kouign amman, scones and more. The staff are friendly and knowledgeable, and the pastries are delicious. I can’t wait to return and try more of their treats, including some of the savory ones. *Gordonsville’s Famous Fried Chicken Festival – Saturday, May 20, 11 AM-5 PM, Gordonsville Fire Company Fairgrounds – Celebrate the “chicken-leg center of the universe” and Gordonsville’s long history of fried chicken-making with fried chicken and pie contests, a wine garden and arts and crafts vendors. *Broad Appetit – Sunday, June 4, 11 AM-6 PM, Richmond’s West Broad Street between Henry and Adams Streets – Try $3 mini dishes from some of Richmond’s most renowned chefs and restaurants. Africanne on Main, Casa del Barco, Comfort, Graffiato, Pasture and more will create small plates to try. Beverage options from across Virginia, including beers, wines and ciders, plus local dessert makers will round out your meal. Live music and cooking demos will make this a fun day for the whole family. *Father’s Field Day – Sunday, June 18, 11 AM-6 PM, Early Mountain Vineyards, Madison – Enjoy a variety of local food, including barbecue and various local desserts while tasting some of Early Mountain’s best wines and taking in live music and views of the Blue Ridge foothills from the patio. *Hanover Tomato Festival – Saturday, July 8, 9 AM-4 PM, Pole Green Park, Hanover – This celebration of the juiciest, most delicious tomato in the world offers rides, games, a petting zoo and local vendors plus more tomato dishes than you can shake a fork at. *Pork, Peanut and Pine Festival – Saturday, July 15, 10 AM-7 PM and Sunday, July 16, 10 AM-5 PM, Chippokes Plantation State Park, Surry – A barbecue cookoff and local food vendors share what Southern Virginia is best known for: pork, peanuts and pine. A petting zoo, rock climbing wall and inflatable slide mean the kids will have plenty to do and see too. *Henricus Discovery Program Days Program Series: Food of the 17th Century – Thursday, July 27, 10 AM-1 PM, Henricus Historical Park, Chester – Learn what breakfast, lunch and dinner would have looked like for a colonist or a Powhatan Indian. This program is perfect for kids ages 3-10 and includes a take-home craft. Get out there and have fun exploring this summer! What are your favorite places to visit in Virginia (or your state)? Before a show at The National on Friday night, my husband and I stopped for dinner at Pop’s Market on Grace. The casual restaurant and market is located just down the block from the Carpenter Center and is convenient to galleries and entertainment on Broad Street as well. This section of Grace Street has historically been a part of the downtown shopping district, and is even a designated historic district with the National Park Service. Pop’s Market offers a wide range of quick-service foods, like sandwiches and salads, as well as prepared meals like pastas. I had the Caprese on focaccia and my husband tried the pulled pork hoagie. Both were ENORMOUS – enough that we had a whole meal for Saturday’s lunch. Pop’s also has refrigerated prepared foods, coffee and breakfast items and other local products. The space is expansive, with high ceilings and a prime corner location, as well as architectural details like exposed brick. Dinner at Pop’s Market was fairly inexpensive, delicious and filling. They also have local draft beers for $5 each.